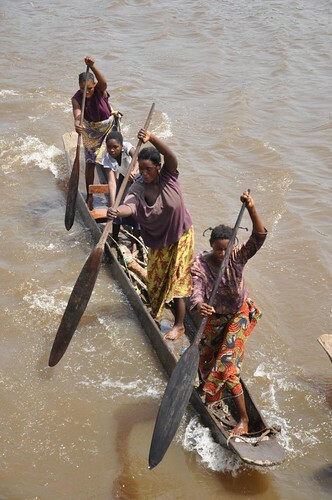 Finding a boat to travel up the Congo River wasn’t easy. Firstly there weren’t many boats on what could and should be a major highway of traffic, and secondly those that did exist had no schedule for when they would depart. But waiting was worth it, for this was a journey like no other. The boat itself was essentially a tug, consisting of an engine room, a few small cabins and a rudimentary cockpit for navigation. Nothing spectacular, and had that been it the journey would only have been half as interesting. For it was the barges this tug (so named the MBKALIOPI) was pushing and the scenes upon them that made the vessel what it was: a floating market, a makeshift shanty town and home for hundreds of Congolese. There were two barges being pushed by the tug. Each was approximately 10 metres wide and 50 metres long. They presented a picture of complete chaos as bodies occupied whatever space was available, seeking shade on the hot metal decks with all their baggage and other clutter under a patchwork quilt of tarpaulins. These flat-bottomed barges were merely boxes of sheet metal, the only fittings being the small bollards wrapped with thick steel cables that held the barges and the tug together. Many people had been on board for several weeks. 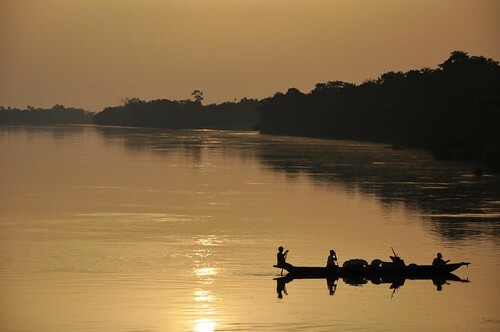 That is how long it had taken the boat to reach Bumba, some 1400km upriver from where it had started in Kinshasa. I have no idea how many passengers were on board and neither did the crew. More than 300 at a guess. Then there were all the animals – a dozen or so pigs and goats, as well as countless chickens and ducks. There was no guard rail around the barge and it still seems a miracle that one of the many babies or young children didn’t crawl over the edge. I’m sure many have done on other similar barges in the past. Few would survive, particularly during the night. For all these people to eat, sleep, clean and use the toilet in such a confined space presented a challenge, but life on the river was familiar to many. Most were travelling with the specific purpose of buying and selling goods along the way. This wasn’t their first journey. 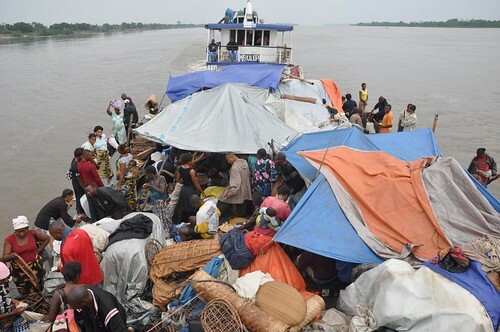 What was cheaper to purchase in or close to Kinshasa would be transported upriver to be sold for a profit, and what was cheaper in Kisangani where the boat terminated would be bought to transport downstream. Fish dominated the scene. 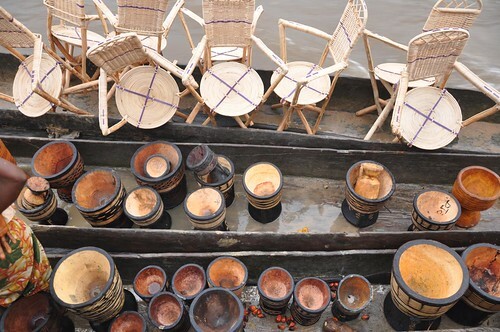 Stacks of flat wicker-made baskets containing salted and smoked fish filled the barges. What a smell! 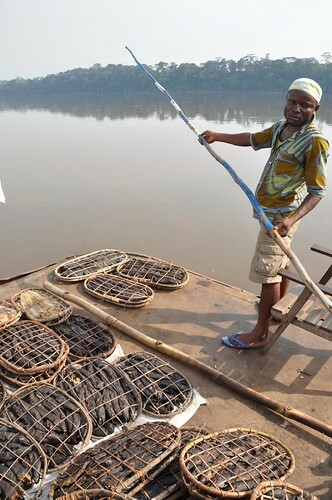 I assumed they would be cheap on the understanding that the river contained plenty of fish, but as the boat approached Kisangani people came aboard and paid $15-20 for one of these racks, perhaps containing 20 fish. I personally think tinned sardines are a better deal for money – one gets 3 fish for less than $1. These scenes of commerce provided the most interesting aspect of the 8-day journey that was to take me 400km from Bumba to Kisangani, where I am now. For many people who live along the river bank the sight of an approaching barge provides an economic lifeline, for there are no roads to these villages. A barge presents the only opportunity, perhaps for a week or more, for them to buy and sell goods. And so out they paddle in dugout canoes to reach the barge, bringing their goods with them and precariously tying alongside. 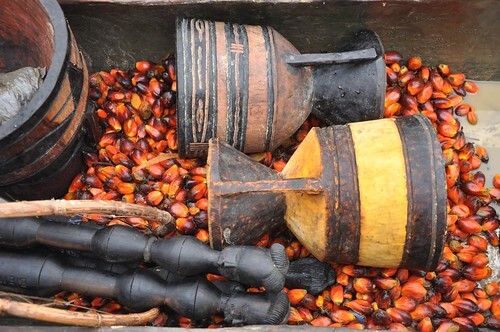 With them might be any number of things: fish, plantain, manioc, avocados, mangoes, pineapples, tomatoes, wicker-made chairs and tables, wooden pestle and mortars, jerry cans of palm oil or palm wine. 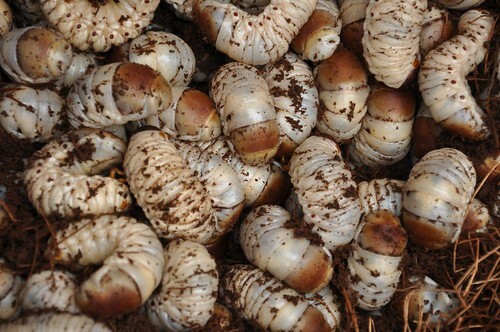 And then there are the more curious things: monkeys, bats, crocodiles, tortoises, snakes, antelopes, huge grubs and snails. If it moves and has meat on it then it’s food. 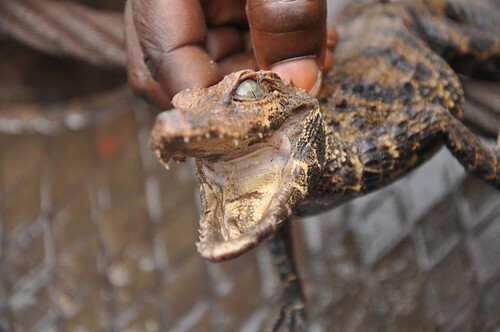 In some respects the sight of baby crocodiles, tortoises and monkeys being sold and slaughtered sickened me, but out here it is a means of survival. The people have always eaten what the forest provides and nothing is going to stop that. Finding a comfortable place to occupy my time on the boat was almost impossible. The bicycle was safely stored below deck alongside sacks of ground nuts and coffee, but my panniers filled a space between two families transporting smoked fish. At first I had planned to rest and sleep here, but the smell, heat and lack of space meant I moved to the roof of the tug-boat for much of the time, returning every so often to be sociable and check my panniers were all intact. It was less likely for something to go missing on the way. Very little could be done in secret with so many people on board. It was on the roof of the tug-boat that Hiromu and I slept under the stars, except when the rain fell, which it did on two nights. Then we got wet, for there was no space under the tarpaulins. Walking around the edge of the barges was something I did with great caution, and never at night. 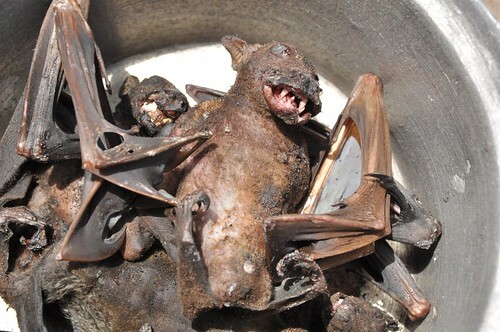 There would be charcoal stoves to side-step, babies being breast-fed and washed, fish being dried, animals defecating, spilt palm oil, wire cables waiting to trip you up – basically a health and safety inspector’s absolute nightmare. Making friends on board was easy. The only trouble was that almost everyone wanted some kind of gift. If they didn’t demand it then I sensed the expectation for one. 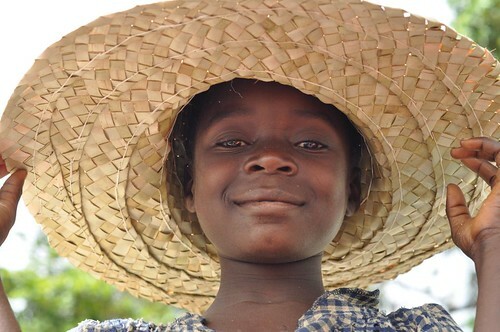 “Pasangani mbongo” (give me money) are two words a foreigner will hear often in the DRC. At least it makes a change from “Donnez moi l’argent”. If I opened a pannier to retrieve something eyes quickly descended on me. As much as I like the DRC and its people, it is perhaps the most demanding of African countries I’ve travelled in. The people didn’t hold back in reminding me how much they were suffering. Well that was evident. The well-being of the passengers was not a priority for the boat and its crew. Their concern was the safe delivery of the cargo (cement, several vehicles and sacks of various other goods). I really felt that if someone had fallen over the side the boat would not have stopped. The risk was constantly there. The Commander didn’t speak to me much. At first I wondered if he regarded me as a nuisance as I clumsily walked around the boat with my camera, but I came to realise he was just someone whose attention was solely focused on the job. The crew numbered about 10, but he was the only one who really knew the river. His eyes were always on it and when a member of crew did something wrong he would suddenly lose his cool temperament and start shouting. This he would also do when there were too many dugouts tied alongside, effectively hitching a free ride upstream and slowing the speed of the barges. An order would then be given for several of the crew to take machetes and slash the twisted vines which acted as painters for the dugouts. Villagers might be in the process of selling something on board at this point. Some would plead with the crew and others would argue. Amongst this fracas of hollowed out tree-trunks bobbing up and down and banging against each other one or two would occasionally roll over. Then I would look back to see several bodies quickly disappearing from sight in the wash of the tug as they held onto the upturned dugout. Poor bastards I thought. They hadn’t finished their sale and they’d lost their produce in the river. It impressed me how passengers were able to remain so calm under the circumstances. Occasionally an argument would flair up and voices would be raised, but in general people accepted their plight and endured the hardship. At night the Commander prohibited the use of torches in case one of his crew at the front needed to flash a signal to slow down. And so the boat and all those hundreds of people moved in complete darkness, until dawn. When the night was too dark or we were traversing a particularly tricky part of the river the Commander would steer the boat towards the river bank and gently run it aground until the first signs of light in the sky. Surprisingly there were far fewer mosquitoes than I imagined. 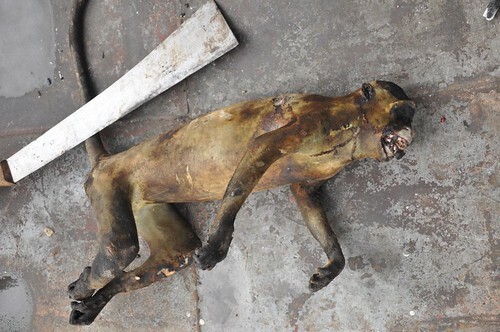 I think they found more meat on offer below the tarpaulins. When the night was clear the waning moon provided the only source of light, silhouetting the river bank and the edge of the jungle. Occasionally a torch-light would shine out – most probably a night fisherman in a dugout. Essentially what I was seeing was no different to what men like Stanley and Conrad had seen some 130 years ago, and other than the western clothes most of the villagers were wearing I don’t think their life has changed much at all. This wearing of second-hand western clothes in the DRC presents something of a cruel reminder of the haves and have nots in this World. 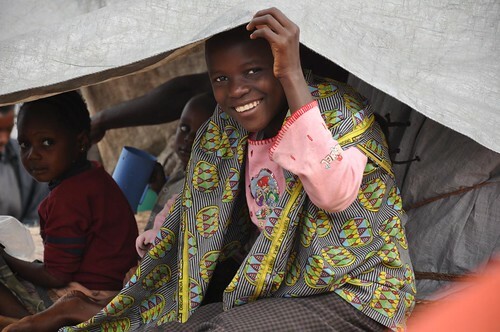 Many second-hand clothes sent by charities to the DRC originated in America. Well the problem is that the waist and chest sizes of most of these clothes being sold are far too big for the sinewy torsos of many Congolese. It is not uncommon to see a man with a waist size of say 26” wearing trousers made for someone far larger. Acting as a belt will be a piece of string to bunch up the loose material. Despite being given the liberty to sit and sleep on the upper deck of the tug-boat (something the crew would have restricted most people from doing) I too endured my own share of suffering. Throughout the journey I had diarrhoea worse than I can ever remember. Squatting over the edge of the tug-boat amidst clouds of diesel fumes didn’t ease matters. After a few days the engineer gave me access to the crew’s toilet. It could have been any number of things that upset my stomach. After eating sardines and manioc on the first night I was soon invited to eat with a number of people. Travelling upstream meant moving very slowly. My GPS recorded the speed at around 4km/hr. What navigation equipment did exist on board wasn’t working. The captain had no chart and received information about the depth of the river from two men standing at the front of the barges with wooden poles. These they lowered into the river until they hit the bottom, after which they would yell out a number. As far as I could understand the draught of the boat was about 2.5m, but as the captain didn’t know exactly what load was on board I think this was very approximate. On a number of occasions the barge ran aground on sandbanks, which often meant several hours or more of reversing and even disconnecting the two barges to move them separately. I never tired of watching the river from the top deck of the tug boat. This offered the most commanding viewpoint, and when there was any wind it was also the coolest place to be. All that metal reflecting the sun’s heat made the conditions on those barges cruelly hot. 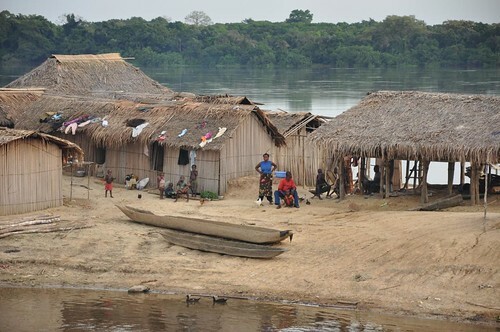 The jungle remained constant, where it had not been cleared to make way for a village of huts, but the river changed its course, narrowing as we passed between large islands before widening again. Some of these islands continued for many kilometres. This was untouched Africa and it was a truly amazing spectacle. 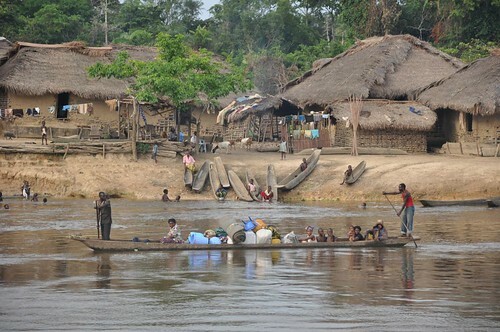 Signs of life beyond those mud-thatch dwellings slowly came into view as the boat approached the town of Kisangani. This is the furthest navigable point for a boat travelling from Kinshasa. For the next 100km a series of rapids prevent onward travel on the river. 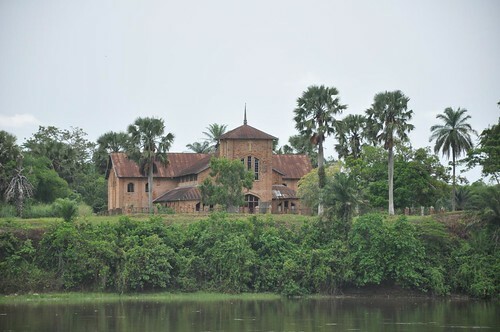 It was a shear contrast from the jungle to see large brick buildings lining the riverbank. Arabs and Europeans fought over and developed the town, and as elsewhere in the Congo I could sense even before setting foot that the place has seen much better days. As much as I was looking forward to stepping on terra firma after a week on that boat, I was also sad that the journey was about to end. For many people who’d started from Kinshasa this had meant 1 month on the river. Despite the hardships on board I was slightly envious that I had not travelled the whole way. For a brief moment I even thought of waiting for the boat to head downstream to Kinshasa. I don’t imagine I will ever take a boat journey quite like this again. I stayed on board once it docked. As expected their were frantic scenes as people scrambled to get off and others rushed to come aboard. “Watch your bags. There are thieves here” someone cautioned me. There were several other boats and barges moored alongside a muddy stench of a riverbank. To call it a port would be misleading. I had to take a second look when up above the moving masses of bodies on another boat I spotted a white face. The first tourist I’ve seen in months, and he was English. 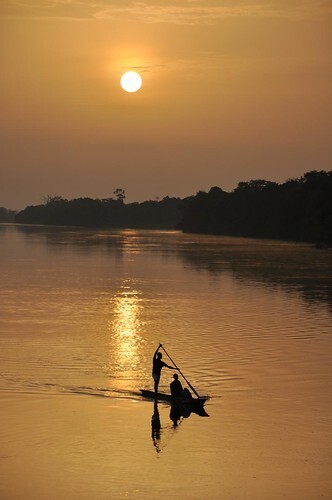 He said he’d been waiting in Kisangani 3 weeks for his boat to head downstream and had been sleeping aboard for 10 nights, having paid for a cabin (his boat was twice the size of the one I’d come on). And there I was thinking that a 5 day wait in Bumba was a long time! He had been told daily that his boat would be leaving the next day. I was impressed with his patience. He recommended a cheap hotel in the town and I told him he was about to take the trip of his life. The next morning after saying goodbye to familiar faces and the crew I lifted the bike out of the hold and wheeled it off. Kisangani awaited me, but I didn’t get very far. Within minutes of stepping ashore an immigration official seized my passport. It was going to be a long morning. Man, you are nuts. I lived in DRC during a couple of years and everyone in Europe thought that I was a crazy Mundele (while guy in Lingala). I did a couple of crazy things in this incredible country but it never came across my mind to travel on a barge. Probably, I am the only reader of this page that knows exactly what you have been through though your description is outstanding. Everyone may imagine the light, the smells, the noises, the fear, the poverty, the weakness, the animals, the rivers, etc. But to live it is a different story. It is an unbelievable story. It is quite risky to travel on a barge due to the lack of medical support. A disease may strike you and take you down in a matter of a few days. It happens and it not that rare. Congolese virus love white people. Flesh is so tender and easy to attack. The smell of death is just around the corner. On the river. On the jungle. On the water you drink. On an accident that may happen all of a sudden. But that is the challenge of DRC: to meet the unknown and to beat it one way or the other. But if you are not tough, just forget it because it may turn out to be a huge disappointment. So close and so far away. I wish you all the best. And during the next few days I will spend some time reading your incredible adventure in Africa. PS: it is not “Pasangani mbongo”. It is “Pesa ngai mbongo.” But the DRC language trademark is “Probleme eza te.”. Basically it means: “There is no problem.”. Which is deeply ironic because the country is overwhelmed with problems. 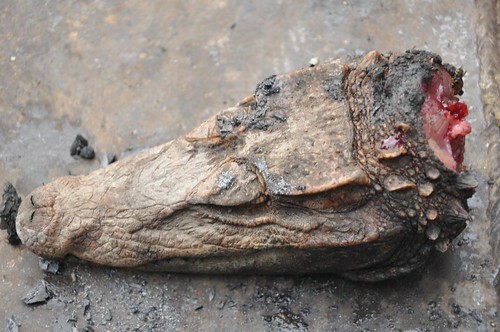 But that is the way Congolese people found to survive the daily sacrifices. This is a real ‘Heart of Darkness’ comment. Travel there was and remains to be an adventure beyond travel in other parts of Africa. Fortunately my health was strong and I met with no major incidents. My memories of the country might have been different otherwise. @Miguel, I rode the boat for the approximately 10-day trip from Lisala to Kisangani in 1982. There were about ten of us backpackers onboard and no one got sick. It seems that there were more amenities then. Our fares included meals, served in a room with a bar stocked with cold Primus, and a loudspeaker system that pumped out wonderful music From Kinshasa by Franco, Tabu Ley Rocherau and others. I even smoked Congelese grass with friendly local soldiers. I also wandered around the barges, but my pictures suggest there were a lot less people on them then there is now. This is a wonderfully written blog post by Peter and the photographs are suberb. Brings back memories. Hi Tom, Thanks for writing this. I will always have vivid memories of this journey. The fact that I boarded at Bumba when the barges were already quite full, means that there wasn’t much space. Had I boarded or looked for a boat in Kinshasa, it’s possible that I may have had more choice. I think compared to the few other non-Congolese who take this journey, I had it quite rough. There was certainly no cold Primus, nor music as you describe. 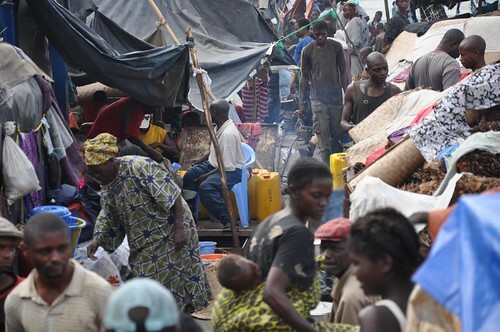 The situation has worsened in the DRC, and those people who make the long and arduous journey up and downstream are more desperate. Despite the discomfort and dangers, I’d do it all again. Perhaps I should…. Wonderful description of river travel. I have written a novel about Congo and will be publishing it soon. 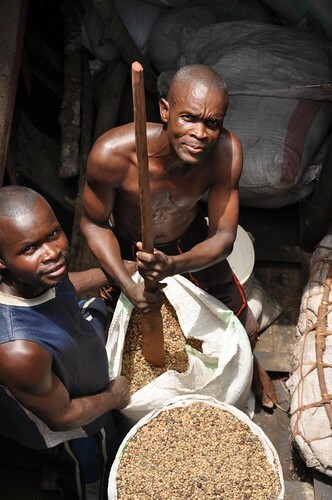 I am writing a series of short articles about various aspects of life in Congo as lead-ins to the publishing process. I would love to use thoughts from your article and a few photos, but I will not do anything without your permission. Have you completed your journey? I lived in Northwest Congo for a year in the 1980s. On my last trip there, other than internet and cell phones, it seemed little had changed. Thanks for commenting. I would be interested to read your book. Let me know what photos you would like to use. I finished my journey last year in South Africa. Since May this year I have been living and working in Tanzania, so Africa is still very much my life. I would like to return to the DRC at some point in the foreseeable future. Hi Scott, Sorry for the late reply here. Please email me at [email protected] It would be a pleasure to contribute as well as read your book. Only one question. What did you do in terms of food during this leg of your journey? Were you able to buy some on the barges, or did you bring some along with you? 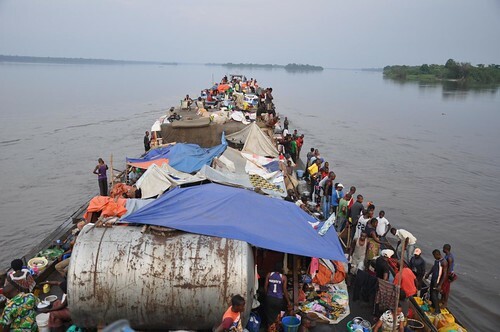 Hi Dominik, Getting a boat from Kinshasa to Kisangani, which I didn’t do (I jumped aboard more than half-way up river in Bumba) is not hard, as long as you have plenty of time to wait. You may be lucky and find a boat leaving soon after you arrive and enquire, or you may have to wait for a week with little confirmation or knowledge of when you will actually go. There is no written rule or timetable – all part of the adventure. Good luck and let me know how you get on. I’m the other chap you met in Kisingani with Josh about to travel 1746 kilometers on one of those barges to Kinshasa. I have to profess that I am not English (oh Canada) but I do have a fondness for fish and chips which I ate plenty of during the 5 weeks it took us to reach Kinshasa. It was truly an amazing journey, one that I will never forget. 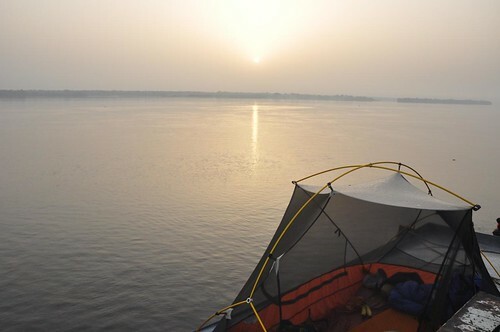 It was interesting that you wrote in your blog…the what if someone were to fall in the Congo, would the boat stop? Well, unfortunately a fight broke out while traveling during the night that resulted in 6 people going overboard, of which only 3 made it out in part because the boat did not initially stop despite the pleas from passengers. Well, glad to be back on tierra firme. Continued safe travels to both you and Hiromu. Next time don’t forget the Lomotil. Where were the chips coming from between Kisangani and Kinshasa? Did you have a personal supply of potatoes? Glad you enjoyed the journey – unforgettable is an understatement. I can imagine many people fall into the river and are never seen again. I walked around the barges on most days and there were a few moments where I was close to losing my balance. Btw, what is Lomotil? 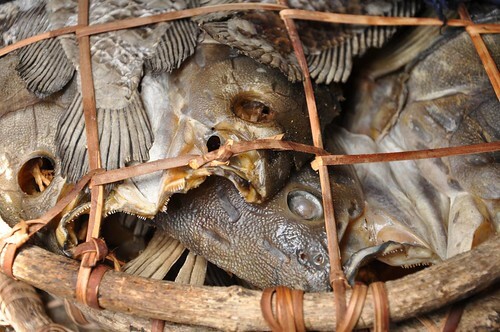 Well, the monkey meat and grubs didn’t appeal to me so I stocked up for the journey with pomme de terres in Kisangani, and of course for the fish it was catch of the day. Lomotil (dphenoxylate and atropine) is used to control diarrhea, which when there are a lack of privacy and toilets can prove to be pretty useful. @Rod Poirier, god bless Lomotil! Great piece. I’d love to travel the Congo but am still tied to gainful employment and thus under considerable time constraints. But it’s still on my bucket list more so now after reading your impressions. It seems like one of those few trips not yet polluted by tourism. Thanks for reporting and bon voyage. Wow – my itchy feet just got itchier. An inspirational peice. Thank you. I normally find travel blogs quite dull and tend to skim through. But not yours. And particularly not this piece. Wow. I’m sitting outside on one of those magical April days you tend to dream off when you are somewhere hot and chaotic. But I want to remind you how lucky you are to be out there. Enjoy it, savour it, and keep sharing it! What a wonderful experience. @Alastair Humphreys, Thanks Al – twas a truly epic journey and would do it all over again. I’ve since circumvented Stanley falls and pushed on upstream – blog post to come…. Hi Peter, this account and photos of the river is fantastic! While reading the comments I could feel how you have been able to get over to your large following the bits of real Africa most people miss or do not realise exists. 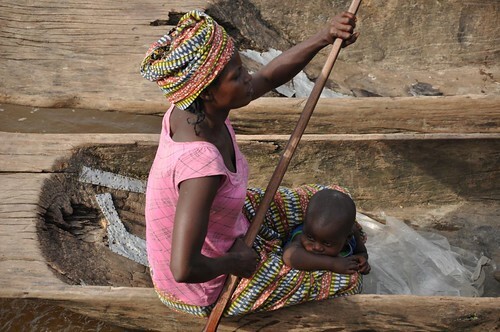 About the kids danger of crawling off the barges – The toddler sitting in the lap of its mother would probably have stayed there until she got back to shore – African kids are very obedient and patient with their parents compared to the western kind! This is a wonderful story! Bon continuation from Dakar! That first photography is amazing. The entire post is, but the chaos of that image show so much. I just stumbled across your blog via Tom @ Ride Earth. Such a great trip you are on and I am more than happy to read all about it. @Jeff Bartlett, Thanks for finding me – hope you’ll follow for the rest of the adventure. This really is an incredible adventure. I really think this is one of the most interesting cycle journeys i’ve ever read about. Incredible! Absolutely incredible! Thanks for sharing the sights, sounds and smells through your word and picture story. Favorite photo (that gave me a heart attack as well!) 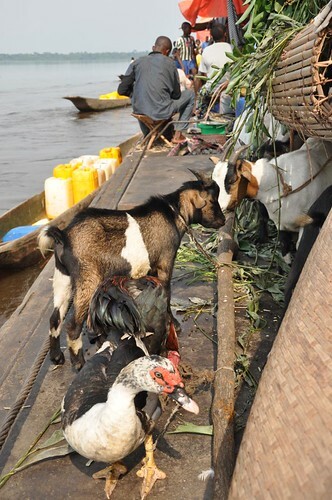 was the scene of the goats and duck with people in the background revealing the possible drop-off experience on the side of the boat. How do mothers sleep?! Thanks for sharing this most spectacular experience with us! Glad you’ve made it! 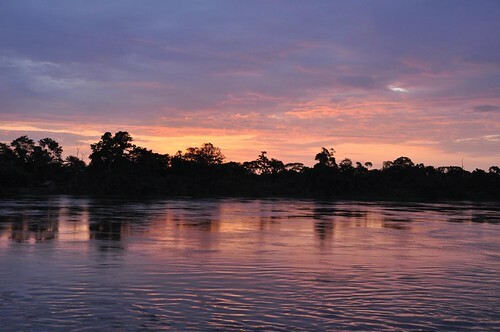 Your report gives us a new dose of patience as we are still waiting in Kinshasa for our boat to leave… Should leave this weekend at the very latest, though we’ve heard that before… sigh. @Isabel, Yes it is worth the wait. What is your plan after Kisangani? I’ve since taken another boat from Ubundu-Kindu and am pushing south east from here. You might be on that boat for 3-4 weeks so unlikely you’ll catch me up – unless you’re continuing to east Africa? Wonderfully written piece of travel adventure in a place where so few westerners go. Surely its got to be one of those last frontiers on this earth. Deepest darkest Africa comes no better than this. Stay well and strong, you both! An excellent account, Peter. Fascinating. Looking forward to hearing how you get on in Kinsangani and I hope you have got rid of the bad guts! Several days on doxycliclone cleared the bad guts. On the move this afternoon. No idea when I will get connection again – terrible Internet here – lucky to get the last few posts up. Very jealous! But glad it’s going well! The videos are available during 7 days. Thanks. Will have a look when I find an Internet connection that isn’t so painfully slow. Peter; wow a terrific account of what you say yourself ‘a truly amazing spectacle’. Trust you’re starting to feel better before getting back in the saddle. Thanks & cheers. This is one of your best journals yet. Your adventures are truly an inspiration for us all. Keep ridin’! Fascinating boat journey! Might I ask how much it cost? I’m sure it was cheap. Did you bring all of your water and most of your food along with you? I paid $20 for the 8-day journey. I believe the locals paid $10-15, but I was happy to pay a little extra for safety of my bike storage and fact that the crew gave me access to toilet and their deck space. I think the journey from Kinshasa-Kisangani is about $40-50 – a bargain for the adventure/experience. Some of the larger boats have available cabins. The English chap I mention in the post paid $70 for a cabin – he might be in it for 3-4 weeks. Having a cabin is great, although I’m not sure how much it would distance me from the people sleeping on the barge. I tried to bring as much water as possible – 15 Litres. The locals drank from the river, but I never had to do this. The crew had their own water and I was able to fill my bottles up occasionally with their supply. I brought tinned sardines and a lot of manioc before leaving, although found people would share their food with me on board. Oh, Peter, this is one of your best entries yet. 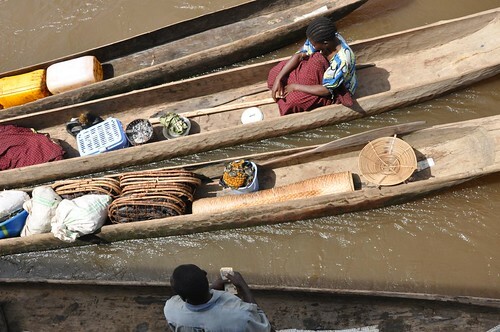 It reminded me so much of my own trip up the Niger River — I’ve got such wanderlust now! I love the details you include, like how the White Man’s Clothes (that’s what they called them in Cameroon) are too big for the people who are now wearing them. And your photos are fabulous. Peter, a truly awe-inspiring account, thank you. And congratulations, very few non-Congolese do this trip!